In the last few months work has been such a stinker that I've really had no time to enjoy my blog (or anyone else's!) but I have noticed that my followers have hit the 300 mark and I've had over 60,000 views so Yay! You! 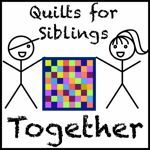 If you win you might want to think about using it to make a quilt to donate to Siblings Together - a wonderful charity dedicated to bringing together siblings separated by our UK care system that Lynne@LilysQuilts has brought to our hearts and minds ... Join the flickr group here to find out more and see how you can get involved. To be in with a chance of winning all you have to do is to be a follower of some sort (because it's you I'm thanking for sticking with me!) and leave a comment below telling me what you'd like to use it for. * to change your settings or to find out if you are a no-reply blogger follow this easy tute.